Includes a free preview of future issues in the collection Presidential Coin Sets . For more information, please refer to the Satisfaction Guarantee tab below. If you do not wish to preview future issues in the collection, you may purchase the single item using the 'Individual Item Only' tab at right. When Abraham Lincoln became President in 1861, the dark clouds of the Civil War were already gathering. After desperate attempts at avoiding conflict had failed and the blood began to spill, "Honest Abe" was forced to become the most active leader in American history - assuming the role of Commander-in-Chief during America's bleakest and bloodiest period. Through it all, Lincoln led the nationwith integrity and determination, emancipating the slaves and ultimately securing victory in the North. Tragically, he was assassinated just six days after the end of the Civil War. Today - 150 yearsafter his death - Lincoln is widely regarded as the greatest President in our nation's history. 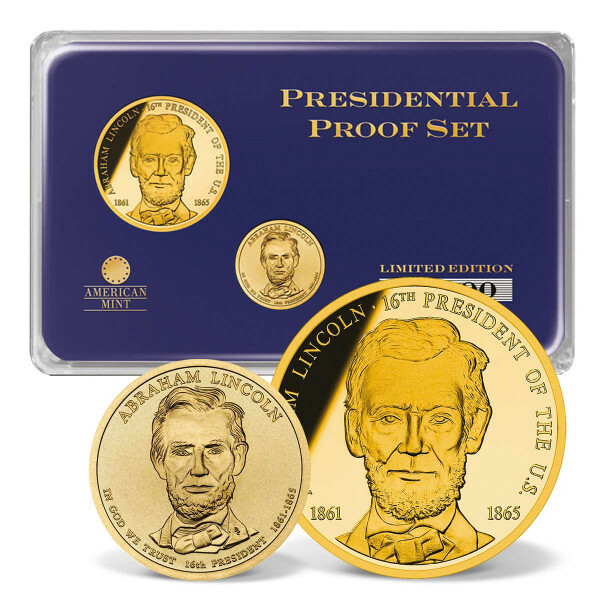 Meticulously designed, this limited edition set features an AMERICAN MINT EXCLUSIVE Abraham Lincoln commemorative coin that is minted to the highest quality "Proof" standard and luxuriously layered in 24k gold. This exquisite tribute also features a "Brilliant Uncirculated" edition of the Abraham Lincoln Presidential Dollar. The Abraham Lincoln Presidential Commemorative Coin Set is strictly limited to only 20,000 sets worldwide and comes packaged in our exclusive KeepSafe archival case toprotect and display your coin set for generations to come.